Late 19th C. scenes from Zuni. “Upon arrival at the Pueblo of Zuni, the spokesman and the interpreter of the Catholic Zunis, a certain Zuni Nick approached and welcomed the young friar to the village and took him to the home of Leopoldo Eriacho who was able and willing to give food and shelter to the Missionary. The Indians showed Father Anthony the “Casa de Santo Nino”. Father Rembert went on to Blackrock to say Mass there the following morning. Father Anthony made arrangements for Mass in Zuni. The Catholics were privately notified to avoid interferences. That evening Father and the lndians had a short conversation about Father Anselm. Then I asked in fervent prayer the Blessed Virgin Mary (“Our Lady of Halona” as she was known at Zuni) to help with this arduous task of rebuilding the Faith of these people. Mass was celebrated in her honor the next morning. “January 1922. I visited Zuni for a week and discussed plans to obtain a plot of ground for a chapel as a suitable place to offer the Holy Sacriﬁce, and to administer the sacraments. The children baptized, must be instructed. A room where the Padre can stay a few more days besides Sundays is also necessary. Here again the few supporters of the Padre were very difﬁdent…believing as they had been told so often that the Padre would tax them excessively, wheat, corn, lambs, children, etc. ; they were also to believe that any child baptized belonged to the Padre. Some, (I believe only a few) believed that the Padre would choose and compel their most charming maidens to serve him. February 2. The meeting had to be postponed. It was impossible to pass the road with a car. The Padre tried to make the trip on a bronco, but he got away; Padre had to trail the bronco about 8 miles towards Gallup. After capturing him at the edge of a cliff the Padre rode back to Gallup. February 11. A meeting [in Zuni] was called for 7 p.m.; only a few were present. We had just to chat and wait. At first thought no more would come but continuously one or two at a time would come. A boy would have to call the different men. The Indians were slow in coming for the meeting to avoid attention of the dissidents. What a task to convince this group that the Government (to the Zunis, known as Washington) will allow the Padre to come here regularly if he knows that there are a number of families here desiring the Padre’s service. The Government must have this in writing and signed by the Indians at least by a number of them. Yes, they all understand. When another friend arrives, all must be told over again. It seems now that everybody understands it and wants it. Now, to sign! Not so quickly. The Indians look at the young Padre. They question the government regulations. Where will the Padre go—Who will see the papers — then they ask about Father Anselm. The Indians did not sign for him. Too courteous to express doubts of trust [and] worthiness of the young Padre, of whom they knew nothing except casual meeting. The petition to the Government for a lot of ground was read and explained. The interpreter explained it also. I assured the old Indians that I would not tell anyone who the signers were and that I would tell Washington to keep all the names secret for a certain reason. Early the next morning the petition was taken to wives and adult children of the signers to get their mark or signature…After Mass the list grew to more than 50 signers. To avoid permitting this petition and list [of names] to fall into non-supportive Government officials’ hands, I took it with my letters to the superintendent, Mr. Bauman. He was to take care of it and to have it ready with his good recommendation for mailing in the morning. Then I rushed to Gallup to report and write to Father William Hughes of the Catholic Indian Bureau. I also asked special prayers for God’s blessing. November 5th. I received notice from Superintendent Bauman that Washington had granted a plot for Mission purposes. The superintendent and his surveyors had already marked off two thirds of an acre immediately west of the Government Day School grounds just across the road. What a debt of gratitude to God! “Gratias agamus Domino Deo Nostro” with deep affection at Mass and many times during the day. What rejoicing among the Indians. Success was theirs. This was the first step of success to have a Padre of their own. April 10 1923. Father Fridolin [Schuster, O.F.M. ], Missionary among the Laguna Indians, wishing to help the new mission advised me of the fact that he had a donation of 1680 dollars for a chapel to Saint Anthony; offered [it] for Zuni if I could obtain the donor’s consent for the transfer. What a blessing! May God move the heart of the donor favorably. I lost no time in writing to Mrs. Grassley of St. Bernard, Ohio, the above mentioned benefactress. April 11. I made a trip to Lukachukai to consult Rev. Father Berard and Brother Gervase [Thuemmel, O.F.M.] on a plan for the chapel. April 13. I made a trip to Chin-Lee to ask Father Leopold [Ostermann, O.F.M.] for Brother Julian [Elpers, O.F.M.] for the time when I should obtain money and permission to build. April I5. I sent a report to Father Provincial [Very Reverend Edmund Klein, O.EM.] and asked for his blessing. April 25th. Mrs. Grassley becomes benefactress of the new Mission and insists that the Patron of the chapel be St. Anthony. Well and good, St. Anthony must care for the new Mission. Our Lady was Patroness of the old Mission under the title of Immaculate Conception.Then, too, if I should be able to restore the old Church it must be under the old title. April 30th. Father Provincial approves of the plans and tells me to go ahead as soon as Mrs. Grassley consents to transfer of funds. May 1st. I saw Novak Poppin Costillo, contractor, for bids for chapel to be built of native stone. 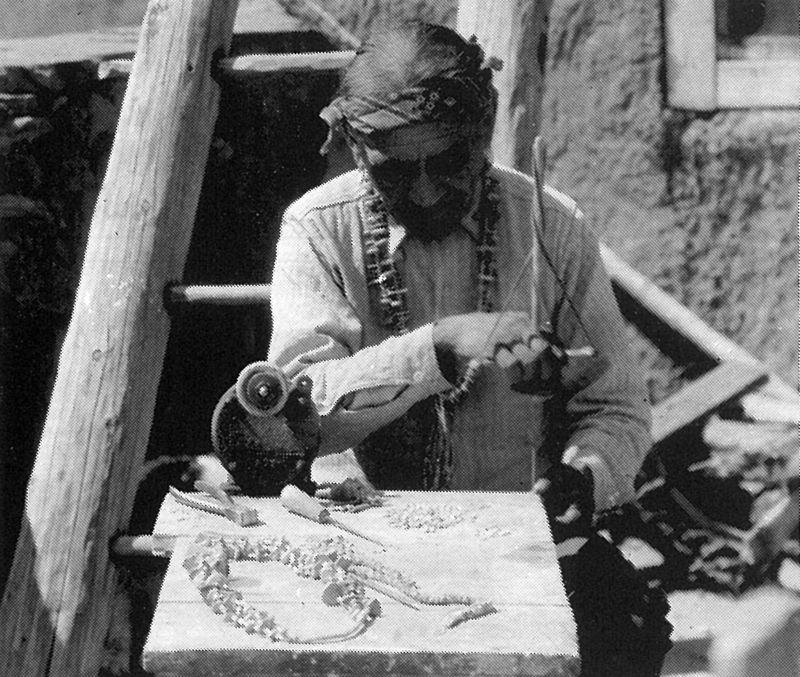 Then I ordered rough lumber from L. E. Morris sawmill in the Zuni Mountains near White Water. I sold the Dodge touring car to Father George [Hoch, O.F.M.] for the price of a new Ford truck Model T.
May 10th. I bought a truck at Albuquerque. Brother Vital [Huelshorst, O.F.M.] from San Fidel met me there; helped me select a suitable truck so I could do my own freighting from Gallup at the same time that I was making my regular visits to the mission. May 15. All bids rejected; arranged with Poppin. May 29th. I spent the day getting quarry men and Zuni Indians to haul the stone. The Fathers advised me paying Indian labor usual wages. Supt. Mr. Bauman advised me employing better laborers among the Zuni lndians irrespective of their religious affiliation. The idea of cash appeals to the Zunis especially in spring time when provisions are low and credits about to run to limit. Giving him employment means helping the Zuni. June 4th. L. E. Morris sent ﬁrst loads of lumber for the chapel. With government permission I stacked it on Day School grounds, 50 that evil minded [persons] could not make away with it or destroy it. Father Benedict [Moellers, O.F.M.] said Holy Mass at Blackrock. I said Holy Mass in “Casa de Santo”.This time I had a better attendance, and also one baptism. Then we returned to Gallup. June 10th. The ground for a chapel was blessed and actual building began. June 15th. The quarry men were kept busy to supply masons with stone. Brother Julian and I laid the floor joists and worked over time so as not to delay the masons. Brother Julian and I boarded with Eraicho so we could be on the job. July. Mr. Bubany, Gallup, hauled window and door frames with other material….bought at his lumber yard. Door and window frames were set. One morning Leopoldo’s horse (one of the best teams on the reservation) was brought from the ﬁeld, where he had been grazing over night, limping very badly. A pop bottle top was hammered into the soft part of his hoof. It was also found that a ten penny nail was driven straight into the horse’s foot. A mean trick of somebody who resents Mr. Eriacho’s hospitality to the Padre. Would he tell Padre to go to some other house? No, [others] shall not interfere in his business, but he will put watchmen out to catch the culprit if he tries any other tricks. I received a letter from Father Titus [Gehring, O.F.M.,] stating that a lady, Miss N. Prudom [Norene Prudom, a member of the Osage tribe] of San Antonio, Texas, wanted to help some Indian mission. 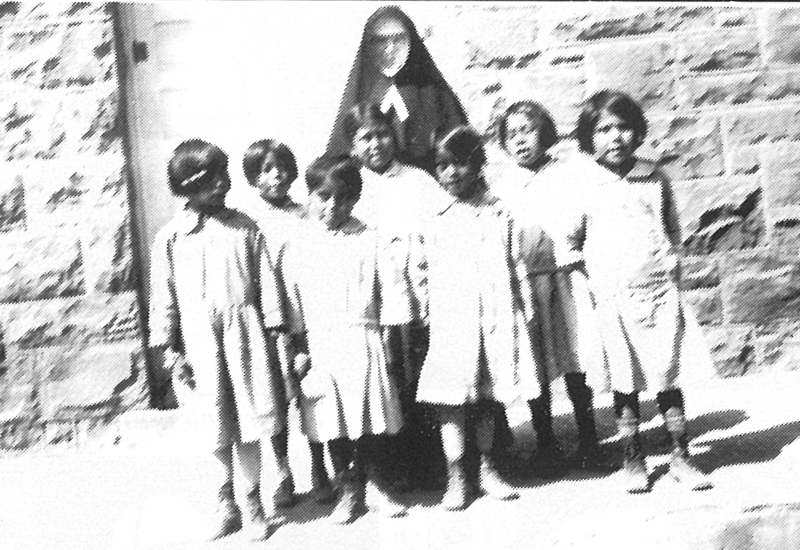 Father Provincial, Father Edmund, ordered me to encourage the good lady to help the Zuni Mission. She proved to be a real God-send for this mission. This good lady promised a donation to start a school for the Indians of this district if God would grant her Father the grace to receive the Sacraments before he died. Miss Prudom’s father had been outside the Church, away from the Sacraments and a Mason for about forty years I started a Novena of Masses for her intention.About two months later God granted her request and Mr. Prudom died a happy death. Miss Prudom had to borrow the money, $7,000.00. She did it gladly in order to keep her promise and to get a school started at once. I was now able to build a school (Day School), capacity of 160 pupils. School had to open in September. August 29 1923. The Chapel and School were dedicated. With that brief sentence in his chronicle, Father Anthony noted the re-establishment of the Franciscan presence in Zuni. The efforts and sacriﬁces of the missionary priests for 384 years were rewarded, the Christian people again had a place to worship, the priests had a residence and there was a school in which to teach the children of the newly established parish. On dedication day, the church and school were consecrated by Most Reverend AlbertT. Daeger, O.F.M., Archbishop of Santa Fe, and placed under the protection of Saint Anthony of Padua. The festive event began at l0 A.M. with a large crowd in attendance. First, there was a solemn procession to the school building. Following its blessing, the procession continued on to the church. There, the dedication was followed by a Pontiﬁcal High Mass offered by the Archbishop and assisted by Father Provincial Edmund Klein of Cincinnati, Father Hartman and Reverend Adrian Kohl, O.F.M., as deacons of honor, Father Rembert and Reverend Benedict Moellers, O.F.M., mitre and crozier bearer and Master of Ceremonies, Reverends Ludger Oldegeering, O.F.M., and George Hoch, O.F.M., deacon and subdeacon, and Reverend Felix Marsinko, O.F.M., and Brother Felix Bruening, O.F.M., as censer and cross-bearer. Reverend Mathias Heile, O.F.M., made a strenuous trip on horseback, but was unable to assist at the Mass. In his address, Archbishop Daeger spoke with pleasure and satisfaction of the fine buildings which had been constructed and thanked the benefactors. He also congratulated Father Anthony on his accomplishment and asked the Zunis to give him and the Sisters a fair trial. The Franciscan Sisters from Gallup provided the music for the Mass, its beauty in keeping with the grandeur of the occasion. They were Sisters Paphnutiana, Angela, Alexandra, Bernadilla, Albertilla, Mary James, Nazaria, Pancholina, Ethelfrida, Generose, Casimira, Seraphia, Agnella, Antonina, Viventia, and Erasma. Father Anthony saw a group of Zunis standing outside the church during the services and invited them to enter. They replied they didn’t think they were permitted to go in since they were unable to sing those songs. 1923, Dedication Day for the church and school. After the Mass, everyone inspected the buildings and pronounced them ideal and beautiful. Again special thanks went to Mrs. Grassley and Miss Prudom, the donors, as well as to the Franciscan Missionary Union which helped to cancel the debts incurred in extra labor and materials and also provided some of the school materials. Archbishop Daeger had also contributed to the Zuni mission project. A temporary dining hall had been set up to feed all present and the same Sisters who had provided the music prepared and served the meal. “The next morning they started on their second attempt to reach home sweet home. About noon they encountered their first misfortune. They got stuck in the mud and it took over two hours of labor to release the cars from the clutches of the drenched adobe roads. They kept on, however, but so did the rain. At about half way they passed ‘a red schoolhouse’ painted gray and some of the crowd who were blessed with foresight proposed to call a halt and spend the night in the empty school building since it was getting quite dark and the worst part of the road was still ahead of them. They were voted down, however, by the chorus ‘Let’s get home tonight’. So they pushed farther into the mud. After pushing ahead for some time the cars [again became stuck] and would go no farther. All able-bodied creatures including priests, nuns and others got out into the mud up to their knees and pushed and shoved until they almost pushed their whole selves through the mud under their feet. It was useless. Exploration parties were organized and along about nine o’clock one came back to bring the good tidings. A deserted house had been sighted somewhere off the road. All pushed forward to this haven of safety. In the house they found a broken down bed, a dilapidated table and a stove. The fire they made Cheered all [but] none had to say grace before or after supper. After a supply of wood on hand [had been used], all retired to get what slumber they could. The next morning somewhat refreshed but hungry, they started in quest of food. After some time, they came across a rancher and he provided them with a ham and had his lady make some biscuits for them and supply them with coffee. These tasted almost as good as the banquet of the dedication. Their strength [restored], they next succeeded in convincing a farmer to bring over a team of mules to help pull the cars away from mother mud. Just at this time, however, the second relief squad from Gallup arrived and they succeeded in releasing the imprisoned cars. The rest of the trip to Gallup was very rough and slow but sure. They got back about 2 PM that afternoon all tired out and hungry. The return trip lasted in all some 34 hours but it will take 34 days and perhaps more to get clean from all the mud. The dedication at Zuni was indeed grand but what came with it will never be forgotten by the occupants of that caravan of cars that came over the ﬂooded Zuni road as long as they live. 1923. Fr. Anthony Kroger (left) and the first enrollment of students. The school was opened ﬁve days later on September 3, because that was the date for the Government school to be opened. Father Anthony had obtained permission to take those students whose parents had consented to the transfer, but could not take them after the semester started. So, the school building, built to hold 160 students and far from completed, was pressed into service. One room was prepared for the students with a floor and plastered walls and 43 students began their studies at Saint Anthony’s school. Mother Katherine’s school at St. Michaels was unable to supply teaching Sisters for the school opening, so Fr. Anthony requested assistance from the Sisters who were teaching in Gallup. Mother Bernarda, Provincial Superioress of the Sisters of St. Francis in Lafeyette, Indiana, promised two sisters, Sister Casimera, Superior, and Sister Solaria who arrived for the opening of the school year. The Catholic Indian Bureau in Washington, D.C., authorized $l,000 yearly salary for three sisters. This was finally increased to $l,500 in l948. Sisters Casimera and Solaria were given living quarters in another part of the unfinished school building. When they moved in there was no floor and the Walls were unﬁnished. They had a stove for cooking, a table, a bed and nothing more. Light was provided by kerosene lamps for students and sisters alike. The written description of the dedication also included a “wish-list” of needed items to complete the school: $2080.00 to complete the building, $75.00 for at least two heating stoves, and $24.00 for a stove for the sisters. The mission was obliged to furnish the children with clothes and books at that time and the Sisters offered to “make-over” old clothing. Each child was issued two sets of clothing each year, one when school began in the fall and the other at Shalako time, a ceremony of great importance to the Zunis and held early each winter. The boys received underwear, overalls, a shirt, socks and shoes and the girls were given underwear, a dress, stockings and shoes. 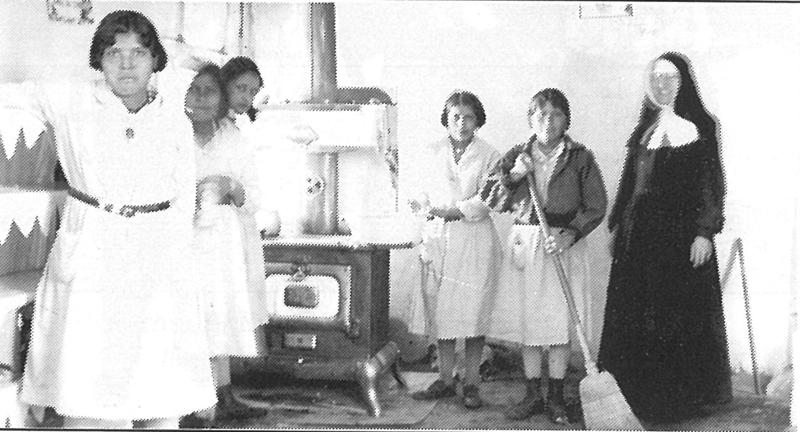 The clothes were washed (until electricity, by hand) and mended by the sisters. The clothing policy was being carried out at the government school also. As enrollment increased, it became more difficult to supply the clothing, especially shoes which cost $2.00 a pair, and a “Shoe Club” was established. Appeals were made to donors to help provide shoes for the children. Finally, in 1934, the supplying of shoes was discontinued and in 1936, all clothing issues were ended. At first the Zuni people were reluctant to come to the church because their identity would be revealed. But gradually more and more arrived. They also were sending more children to the school and by the next September 62 were enrolled. On July 16, 1926, Reverend Arnold Heinzmann, O.F.M., arrived to replace Father Anthony, who had to leave Zuni because of poor health. Before he left, Father Anthony obtained the necessary signatures to obtain more land on which to expand the growing complex. This was granted in April, 1924. It was necessary to accommodate school schedules and activities to Zuni lifestyles and religious practices. Several children, whose parents spent the summer in farm or sheep camps, were often late in starting school. And, during the important Zuni ceremony of Shalako, usually held in December, school was on vacation for a few days, because the students were attending the ceremony. The children, because of cultural practices, were responsive to the needs of the Sisters. In one recorded incident the Sister who kept house for her fellow Sisters took sick. She was taken to the hospital in Gallup. When the twelve o’clock dismissal bell rang, one little boy wanted to tell something to the teacher. He said,“Sister, no one cooked dinner for you, now you have nothing to eat. Come with me to my house and my mamma will give you some dinner”. On their second Thanksgiving Day celebration, the Sisters noted that the Government school across the street was in session. They discovered they had celebrated one week too early because they didn’t have a calendar. In 1925, the first class of ten received First Communion and another sister, Sister Bernadine, came to the school and in l926, the ﬁrst ten children were Conﬁrmed by Archbishop Daeger. A group of students in 1929. In 1927, construction began on a new rectory and this was completed in May, 1928, under the direction of Father Arnold and Brother Gervase. Soon after that the church was enlarged and extended on the left side. Electricity became available in all buildings in 1929 and central heating and a modern water supply was installed in 1930. The after-school responsibilities of the Sisters such as cleaning, sewing, milking cows, gardening and sending out annual appeals for funds, would be made easier with these conveniences. 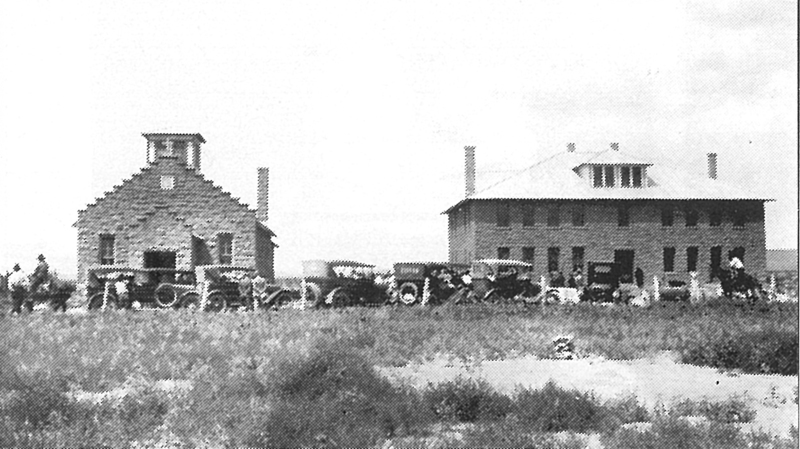 Father Arnold stayed at Zuni until July 29, 1931, when he was replaced by Reverend Clement Druehe, O.F.M. who remained as pastor for nearly 21 years. He was on hand to oversee the construction of an organ loft in the church and the installation of a new organ early in his tenure, and in the year of his arrival, the first eighth grade graduation occurred. School enrollment increased rapidly despite the construction of a Government Day School at Blackrock. 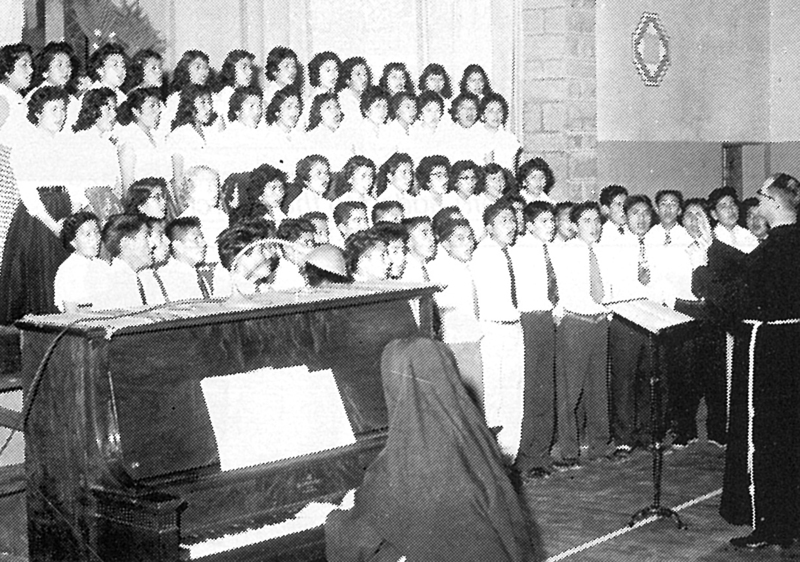 The number of students kept growing because the parents, both Christian and non-Christian, were impressed with the devotion and commitment of the teaching Sisters and before many years it was necessary to add a high school. Federal law required the children to attend school until the age of 18. That meant the children would have to attend off-reservation boarding schools, either sectarian or government. 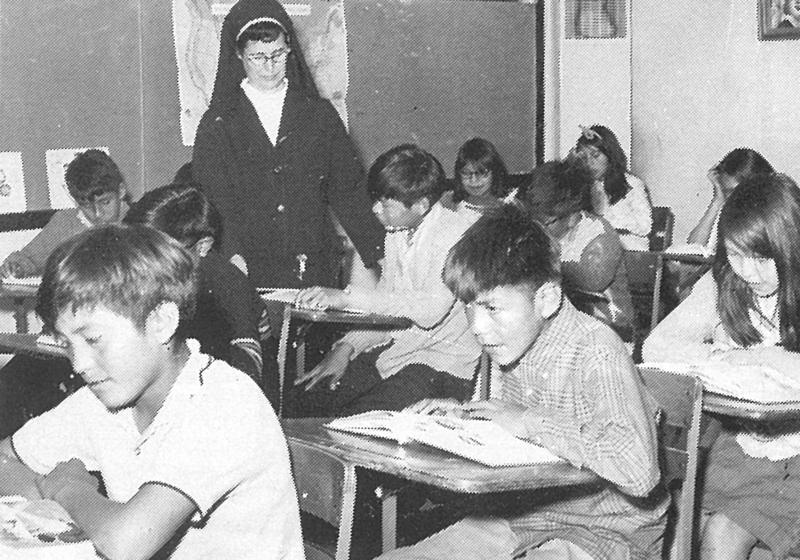 To enable the students to continue a Christian education on the reservation, a high school was started in 1933 with grades being added until full senior enrollment was accomplished in 1948.The high school was continued until the l957-l958 school year when the grades l0 through l2 were discontinued because of lack of teachers. 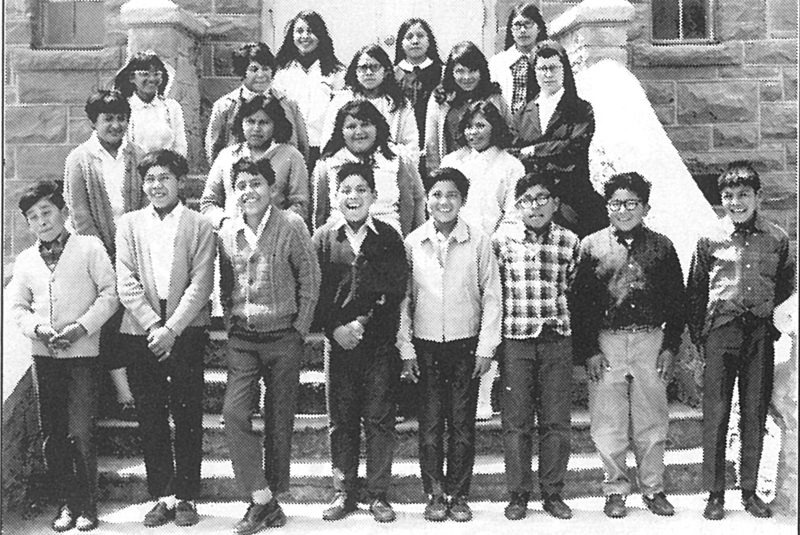 The students were then bussed to the Gallup Cathedral School. The 9th grade was continued until 1963. 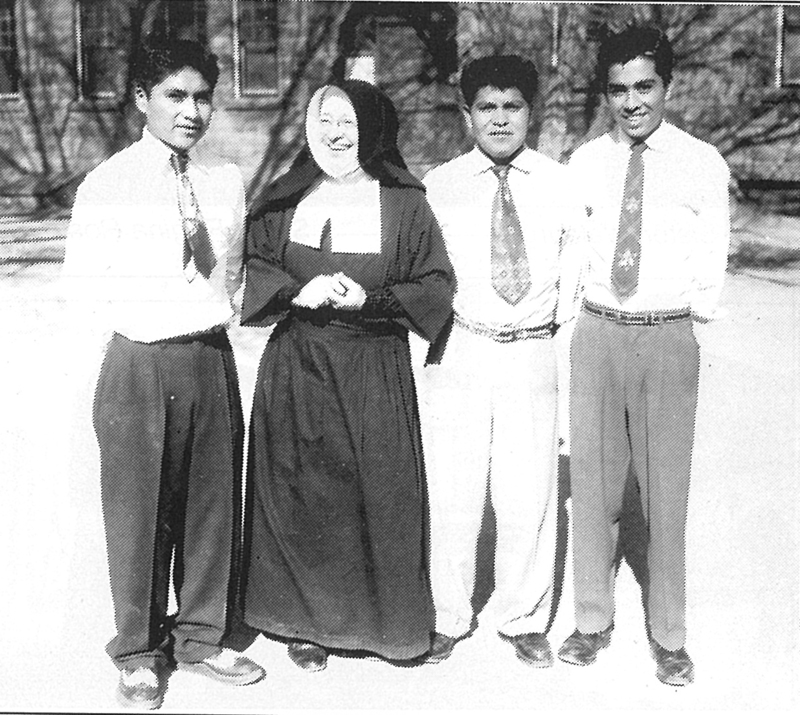 Sister Cunegundis with some of her students. Extracurricular activities abounded for the children in the early years. A Sodality of the Blessed Virgin Mary and co-patron Blessed Katherine (Kateri) Tekakwitha was formed. The girls were informed by the Sodality headquarters that they were the first group to have Blessed Katherine as patron. The boys had the Young Men’s Society and a CYO was formed. The children participated in the 4-H Club and entered their projects in the Zuni Fair and the Gallup Ceremonial as well as the 4-H Achievement Day judgings. The high quality of their work was proven by winning 24 first place prizes and six second place prizes the ﬁrst year they entered the Ceremonial contest in 1926. They also won l2 first places and 14 second places at the Zuni Fair. One notable entry was a model duplication of Saint Anthony’s school, church, buildings and grounds constructed by the 6th and 7th grade students. They had even included bake ovens and flowers. Another group prepared a display of a picture story of the Zuni legend of the Twin Mountains as told to the Sisters by the first grade students. To tell the story, two rollers were set into a frame about 18 inches square and over these rollers ran a photo sheet. 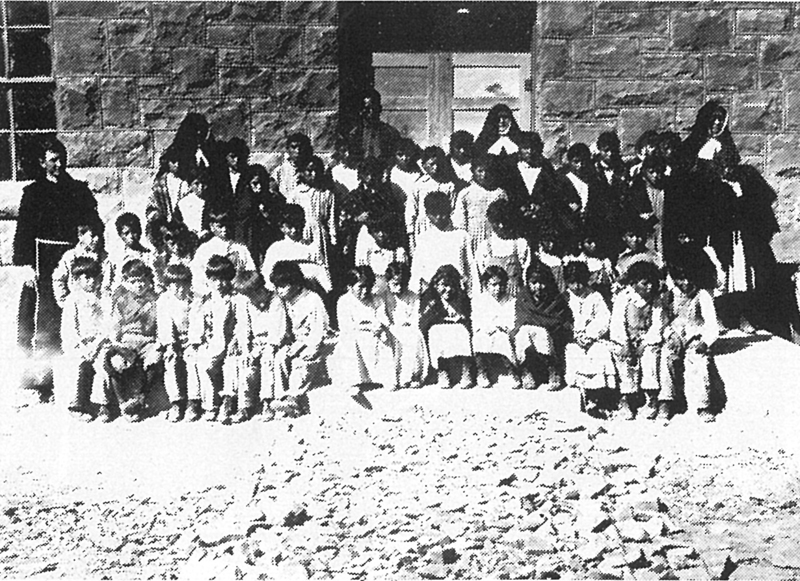 At the 1933 Zuni Fair the children presented an evening pageant depicting the first conversion of a Zuni Indian to the Catholic faith. The hour long program was concluded with Zuni dances as a token of their approval of the conversion. Father Clement had also prepared and ﬁnanced a band, composed of 14 to 16 year old boys, which participated in the presentation. One of the 4-H Achievement Day projects was a description and demonstration of Zuni pottery making. The children continued making projects and winning prizes over the years, including prizes for athletic events. Construction on the growing complex began again in 1938, this time for a building proposed to house an auditorium and a gymnasium, bathing facilities, a medical dispensary and rooms for teaching Home Economics, Industrial and Vocational Training courses and workshops for manual training. In an appeal published in Saint Anthony’s Messenger, Father Clement outlined the need for the above described building in order to meet the growing demands of the school and to compete with other schools in the area which already had these resources. The estimated cost of the building was $15000.00. Once again Brother Gervase was called upon to participate in the Construction activities as he did for the rectory and church expansion construction work. The project was completed the following year and was dedicated in solemn ceremonies on November 22, 1939 as a Community Center. The large building, 128 by 50 feet, was built of red sandstone with a hard oak floor and was equipped for basketball. It had a stage for plays and musical productions. The dedication began with a solemn High Mass sung by Reverend Barnabas Meyer, O.F.M. as celebrant. Reverend Anselm Sipple, O.F.M., of St. Michaels was deacon, Reverend Anthony H. Vorst of Smith Lake, sub-deacon, and Reverend Cletus Kistner, O.F.M., of San Fidel as Master of Ceremonies. Reverend Florentine Meyers, O.F.M., preached the sermon in which he described the work of the Franciscan Fathers in Zuni and explained that the new facility was intended to serve the physical development and mental recreation of the Zuni people. He went on to explain that it was also a religious undertaking intended to bring or strengthen religion to the people. He said that the Mass had been dedicated to Saint Anthony, the wonder worker and patron of the church, school and missionary center, and credited the success of the center to the prayers and support of Saint Anthony. Also in attendance at the dedication were Reverend Leo Oellmann of Smith Lake, the Franciscan Fathers Camillus Fangman, Clement Druehe, pastor of Zuni, Winfred Stauble, Quentin Hauer and Francis Borgman, and Franciscan Brothers Lambert Doll, GervaseThuemmel, Gotthard Schmidt and Cyrill Hammond. After the church services, a procession comprised of the children of Saint Anthony school and the government school and a large number of people of the village and visitors from neighboring towns in New Mexico, marched to the new building for its blessing. Then the children entertained with songs, drills, dances and music. This was followed by an elaborate turkey dinner prepared and served to all by the Sisters. 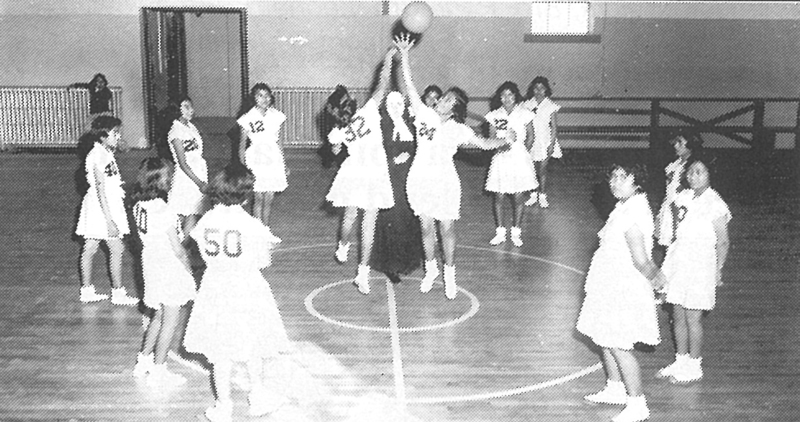 Soon after this festive day, in 1940, the first basketball tournament was held in the gym! In that same year, Father Florentine was assigned as assistant pastor at Saint Anthony’s. Evangelization and teaching and home and hospital visits to the sick and dying by the priests and sisters continued at the mission and along with these responsibilities the fathers and brothers found time to paint and re-decorate the church. 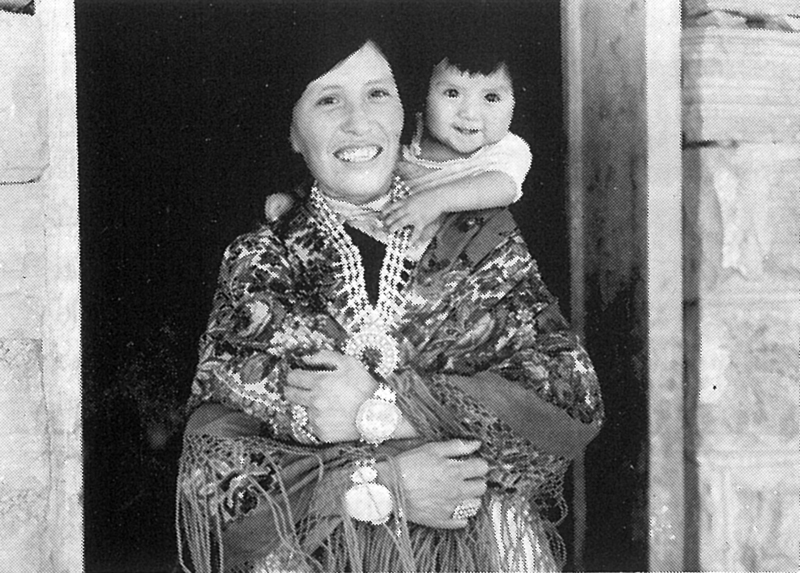 During the war years of the early 1940s, Zuni was affected by restrictions and shortages as was the entire country. More than 200 young men served in the Armed Forces, a large percentage of the entire population. At Christmastime during the war the children painted cards with religious symbols for the Red Cross to send to the servicemen. Some of the cards went to Zuni men who responded with letters of appreciation. By 1948, the Silver Jubilee year of Saint Anthony’s, the high school had ﬁnally grown to include the senior year, and the school had an enrollment of 187. With the increasing student population, more classroom space was necessary and it was decided that the construction of a residence for the sisters, who were still living in the school building, would help the situation. The sisters note in their chronicle that their fervent prayers for funds to meet this need were answered with a bequest from Mrs. J.T. O’Dea of Canton, Ohio, who willed $5.000.00 to Saint Anthony’s. A convent and a garage were constructed by a Gallup contractor using Zuni labor and dedicated on September 6, 1948, in a festive ceremony commemorating the 25th anniversary of the parish. By this time, Gallup had become a diocese to serve the large Native American population in the area, and its first bishop, Most Reverend Bernard T. Espelage, O.F.M., was present for the occasion. He blessed the new buildings and, with his Chaplains, Reverends Anthony Korchek, O.F.M., and Finnian Connolly, O.F.M., presided at the High Mass celebrated by Father Anthony Kroger in honor of the patron of the mission, Saint Anthony. Father Anthony, the pastor who began the mission complex in 1923 and was now back at Zuni to replace Father Bertus as assistant, was assisted at the Mass by Reverend Regis Darpel, O.F.M., as deacon and Reverend Leon Korty, O.F.M., as sub-deacon. Father Clement, the current pastor at Saint Anthony’s, acted as the Master of Ceremonies. Father Bertus, his assistant for the previous three years, and now at Sacred Heart Cathedral in Gallup, preached the sermon. The large contingent of visiting clergy formed a choir under the direction of Reverend Emmanuel Trockur, O.F.M. They were the Franciscan Fathers john Joseph Meister, Felix Marsinko, Ralph Zinser, Harvey Karaska, Clementine Wottle, Agnellus Lammert, Patrick MacAuley, Theophil Meyer, Elmer Von Hagel, Francis Borgman, Thomas Blomtrom, Silverius Meyer, Pacian Meyer and Pius Winter, and Reverends Eugene McCarthy ofWinslow, Arizona, and Charles O’Hern of Saint John’s, Arizona. Franciscan Brothers Arthur Puthoff and Gervase Thuemmel also participated. Large numbers of Sisters of Saint Francis attended. They were from the Sacred Heart Cathedral and Saint Mary’s Hospital in Gallup, Saint Joseph’s in San Fidel, Saint Anthony’s Orphanage in Albuquerque and San Diego Mission in Jemez, New Mexico. At the conclusion of the Mass, Bishop Espelage spoke brieﬂy of his great satisfaction in the work being done at Saint Anthony’s and commented on the progress made in only 25 years. Following his address, the crowd inspected the buildings and later entertainment was provided by the Zuni Indian Band. In 1952, Reverend GilbertWolf, O.F.M., became pastor and died of a heart attack a year and a half later. He was then replaced as pastor by Father Bertus, who served until 1961 when Father Elmer Von Hagel was assigned to Zuni. Father Elmer was succeeded by Reverend Niles Kraft, O.F.M., in 1963,and during the tenure of Father Niles an ambitious building boom progressed. 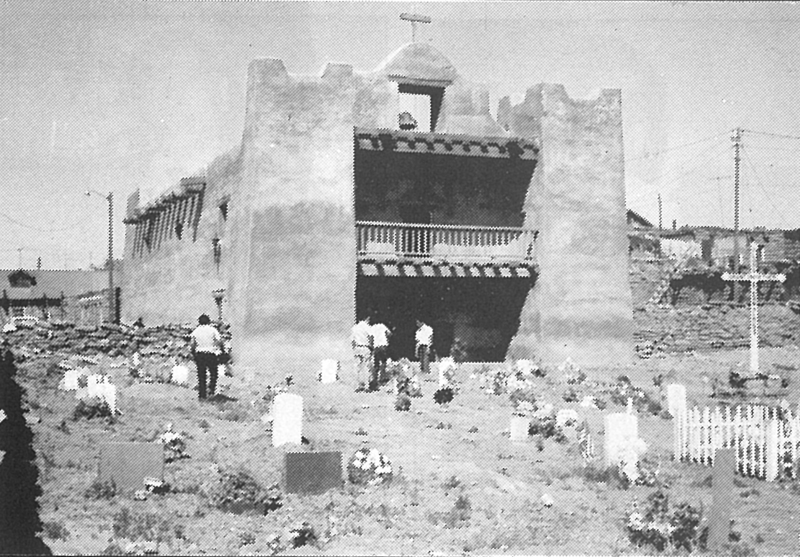 The deterioration of the old Mission church of Our Lady of Guadalupe, built by the Spanish Friars, had long concerned the priests who served Zuni. Many Zuni people themselves, had wanted to restore the church and soon after the mission at Saint Anthony’s was established, the pastors began receiving requests to rebuild the church. In the l950s, the movement grew in strength and in 1965, Pueblo Tribal Governor Robert E. Lewis and the Tribal Council and religious leaders of the tribe, with the supportive interest of the Franciscans, called a restoration planning meeting. Governor Lewis, Father Niles and several councilmen were present. They agreed to start the project moving. Jerry Tuttle, Area Community Development Officer, kept the interest alive. By the fall, an agreement had been reached and the Bureau of Indian Affairs requested the National Park Service to prepare an estimate for the work to be done. Ruins of the old mission. With a lease on the land in hand, the Church agreed to pay for the restoration to be done by the National Park Service. Archaeological investigations of the property began in August, 1966, progressed for three months and resumed in 1967 for three more months. After the excavations were completed, reconstruction could begin and began officially in l968. While this work was in progress, the first Mass in well over one hundred years was concelebrated in the mission on Christmas Eve, 1968, by Father Niles and Father Lery Wendling, O.F.M. In preparation for the Mass, the pews were carried over from Saint Anthony’s and the church was decorated by the Zuni women with rugs and blankets hanging about the building. At the Midnight Mass, which was filmed by an Albuquerque television crew, pageants and dances were presented before the Mass and at the Offertory. The adults wore their native costumes. Families who helped restore the Old Mission received an Apostolic Blessing Certiﬁcate sent from Pope Paul Vl. Masses were continued there until January 4, 1969, when the pews were returned to Saint Anthony’s. Reconscruction was then continued. Meanwhile, construction had been going at Saint Anthony’s complex. A large and modern cafeteria building was completed in 1966. It was constructed of colored cement block, Oregon pine beams and inlaid Celotex flooring. The kitchen featured stainless steel appliances. The school building was enlarged to contain four more classrooms. This time the rooms had wall-to-wall carpeting, individual heating units, portable blackboards, television outlets and drinking fountains. This addition was completed in December, 1967. Again, a dedication ceremony was held for the new areas. It was on May 30, 1968, at the close of the school year, presided over by Bishop Espelage. The ceremonies included, besides the blessings, programs by the school children and the Zuni Tribal Band. Bishop Espelage and Governor Lewis addressed the group praising the work of all concerned with the educational and spiritual growth of the children. Reconstruction of the Old Mission church was completed in 1970 and plans were made the celebrate the re-dedication of the church along with the Golden Jubilee of Saint Anthony parish. It was now fifty years since Father Anthony Kroger had been assigned to establish a Catholic presence in the village. A two-day event was planned to outshine all the previous gala events marking the progress in the development of the parish. On the first day, May 28, 1972, the 50th anniversary of the parish was commemorated with a jubilee Mass offered at noon by Most Rev. Jerome Hastrich, Bishop of Gallup. Dinner was served later in the cafeteria to about 500 guests. Father Niles gave the invocation and dancers provided the entertainment. Speakers, who congratulated the Franciscans for the work they had done and expressed hope that God continue to bless them in their future work, were Sister Eileen, O.S.F., Provincial of the Franciscan Sisters of Colorado Springs, Colorado; the Very Reverend Roger Hulser, O.F.M., Provincial of the Franciscan Friars, Cincinnati, Ohio, as well as Governor Lewis and Bishop Hastrich. Father Lery, then associate director of the mission, gave the Benediction. A fireworks display lighted the evening. The following day, the Apostolic Delegate, Most Reverend Luigi Raimondi, who had attended the previous day festivities, blessed the restored Old Mission saying: “From his Holiness, the Pope [Paul VI], I bring the Franciscan Missionaries his warm congratulations and paternal good wishes; to you, the community and the Zunis, his warm affection, his Benediction and the expression of his solicitude for your spiritual as well as human well-being.” a very large crowd was on hand as he blessed both the exterior and interior of the building. Concelebrating the dedication Mass that followed with Archbishop Raimondi as principal celebrant, were Bishop Hastrich, Fathers Huser, Niles and Lery. After the reading of the Gospel, Father Niles read a letter granting an apostolic blessing from the Pope to the mission personnel and expressed the personal congratulations of Archbishop Raimondi. A parade through the village followed the Mass. The streets were lined with local and visiting spectators. The parade route ended at Saint Anthony Mission and a buffalo barbecue was served there to 3000-4000 persons! This was followed by Indian dances including teams from Taos, Jemez, Laguna and Zuni. Joseph Jaramillo was Master of Ceremonies. Many speakers addressed the group including the Apostolic Delegate, Bishop Hastrich, Father Huser, Governor Lewis, Jerry Tuttle, the Bureau of Indian Affairs representative, Charlene Nastacio, Miss Indian New Mexico, and Donna Reel, Miss New Mexico. Music was provided by the Zuni Band and a Mariachi group. Bishop Jerome Hastrich and Zuni Governor Robert Lewis at the Jubilee. Restored altar of the old mission. Several donations to the Old Mission and for the occasion had been received and were thanked at this time. The business men of Zuni donated the meat for the barbecue. Regine Steeley presented the mosaic of Our Lady of Guadalupe which hangs on the reredos. Philip Leone of Acoma did the carvings and Mrs. Lois Johnson and Mrs. Pasqual gave the chalice, cruets and Communion plate made of pottery. The festive day ended with a Pow-Wow in which all the dance performers participated with the guests. About the time of the dedication, Alex Seowtewa, a local artist, remarked that he had heard his grandfather describe the paintings of kachinas which lined the interior walls of the church. He requested and received permission to paint kachinas on the newly restored walls. He began in 1970 and the project has been on-going since then [through the 80s]. Alex has received funding from various grants and from visitor donations to continue his work. Over the years he has been joined by his sons, Kenneth, Gerald and Edwin, in this extensive project which has given them international recognition. Sr. Mary Agnes with students. The growing school enrollment and changing educational standards required almost continuous work to accommodate the children and their instructors. This time, the expansion included a teacherage unit and a new school and educational center, which contained a resource center, library and educational electronic equipment. Bishop Hastrich dedicated these buildings on May 31, 1971. Ceremonies began with Mass in the church and proceeded later to the new buildings. An article in the Voice of the Southwest, June 5, l97l, noted that 150 priests, brothers, sisters and lay persons attended the dedication, dinner and entertainment. Bishop Hastrich, Governor Lewis, and Mr. Robert Cahill, principal of the school, addressed the group, noting the accomplishments brought about through church and tribal cooperation. The Master of Ceremonies, Joseph Jaramillo, presided over the event. Entertainment was provided by the Zuni Tribal Band and the school children. Festivities concluded with Benediction of the Blessed Sacrament by Reverend Lery Wendling, O.F.M. The past 25 years of Saint Anthony Mission have not been uneventful. The American Indian Day celebration began in 1973 with all the children involved, performing Zuni dances in full traditional attire. They were taught the dances by Fernando Cellicion, practicing weeks before the event. Preparation for the dances is a long process which requires the assistance of the parents. Later they stay on to enjoy the dances and to make necessary reparations and adjustments to the costumes. The children are encouraged to participate because the properly done dances help to instill in them a love of their tradition. This is an annual event attended by large crowds, and over the years music has been provided by records, tapes and local groups. 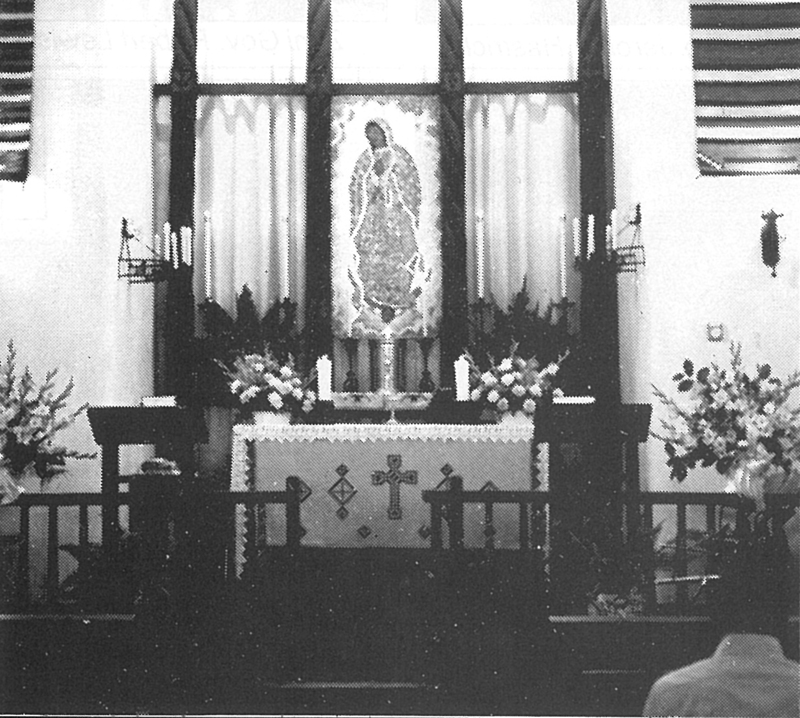 In the American bicentennial year of 1976, Zuni and the Old Mission church became involved in the celebrations occurring throughout the country. A re-enactment of the Dominguez-Escalante Expedition of 1776 was planned by a group interested in making the same trip using the priests’ records of their journey as guides. To start the events, Mass was said at the Old Mission church by Bishop Hastrich, who again wore the old vestments for the occasion. The electric lights were removed and the evening Mass was conducted by candlelight. A bicentennial plaque was placed in front of Saint Anthony’s church to mark the occasion. The structures at the mission complex have not been safe from vandalism and natural disasters. In 1971, a fire set by vandals in the kindergarten room caused severe damage. The fireproofing which had been installed in the school contained the ﬁre and prevented more extensive damage to the school. In 1974, a break-in again occurred, resulting in small thefts. 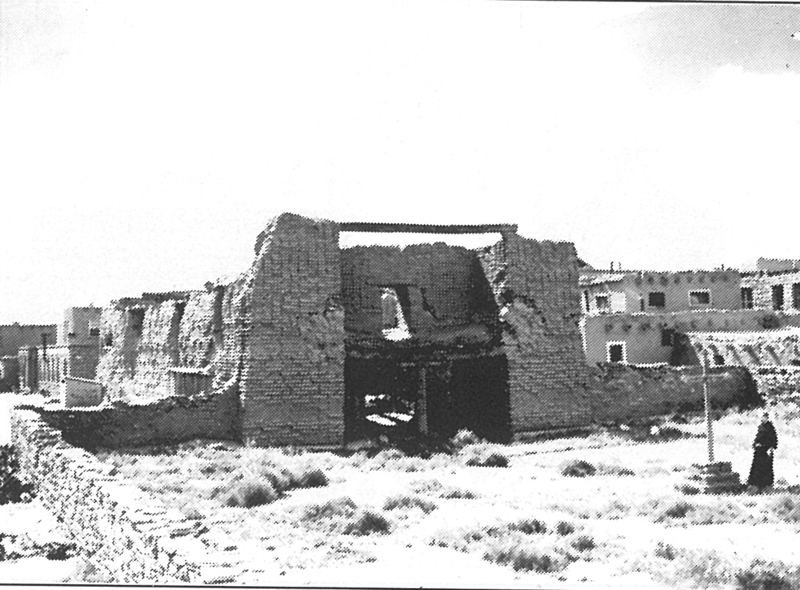 In 1976, Zuni experienced its first earthquake in living memory. Convent walls and pipes in the gymnasium were damaged. A second earthquake occurred the following year with no damage. On April 16, 1977, vandals attacked the cafeteria, throwing food and soap onto the floor and spraying the fire extinguishers over the rooms. Nearly a year later, in January, 1978, there was a fire in the old school destroying seven classrooms. Many people rallied to help save books and equipment from the flames. Nevertheless, nearly $200,000.00 in damages occurred and classes had to be relocated to the gymnasium basement and to the convent until repairs could be completed. Then, on November 3, 1983, a vandal started a fire at the Old Mission which did considerable smoke damage and weakened the beams over the front double doors which were a complete loss. Many volunteers pitched in to help clean up the damage and the door was replaced. In 1987, a serious water leak caused heavy damage to the convent, even washing out fifteen large outside wall stones. The floors and walls in the area had to be replaced. The repair of all damages cut heavily into teaching funds. On-going maintenance over the years required re-placing roofs, painting the chapel and other buildings, and a major improvement involved having the yard black-topped between the buildings to eliminate the mud problem. The Old Mission had to be sanded and repainted, and water seepage which was damaging the north wall had to be controlled. Until 1965, teaching was provided by the priests and sisters of the parish and school. Besides the ever-growing attendance at the school, a tribute to the quality of their teaching was noted when one teacher, Sister Philonella, went to Washington, D.C., in 1983, to receive the Teacher of the Year award from the National Catholic Education Association. In the early seventies, because of a decrease in vocations, fewer sisters were becoming available to provide the teaching, and it became necessary to hire lay teachers. A residence was constructed to provide small apartments for them. Many ﬁne teachers have come to Zuni bringing with them experience from all over the world. It would be difficult to note all who have taught in Zuni, but there is one outstanding man who should be mentioned. In 1983, after retiring from a full career in the United States Air Force where he was aWorld War II ﬂying ace who had won many medals for valor and who later served in Japan and Germany as an Air Force instructor, James Elliott ended a search for a place to spend his retirement and utilize his talents when he came to Zuni. His first assignment in Zuni was as physical education instructor and religion, math and science instructor to the 6th, 7th, and 8th grades. He ﬁnished his ﬁrst year by mobilizing the children to collect bottles and aluminum cans to raise funds with which they bought Glory and Praise hymn books for the church. He also arranged for a case to be made for the books. After a couple of years he was the instructor for PE and for computers. Over the 11 years he was at Saint Anthony’s, Jim worked as an unpaid volunteer relying upon his military retirement pay for subsistence. He met frequently with his military friends, encouraging them to donate computers, sports equipment and other teaching materials to the school. He was always available for non-teaching projects around the mission, helping the priests and sisters wherever and whenever he could. When he died of a heart attack in July, 1994, his love and devotion to the children of Zuni was noted and repaid when the Tribe granted him the privilege of being buried Zuni-style on the reservation. Local families provided the burial blanket and other objects for his grave. Former students served as pall bearers, lectors and servers. A second-grade student wrote about Mr. Elliott and read the paper after Communion. His family and his friends at Saint Anthony Mission mourned his loss which is still deeply felt. The mission has always been supported through donations and to meet growing enrollment and modern educational requirements, constant appeals for funding are necessary. Over the school’s many years the pastors have been obliged to think of new ways to accomplish this. The local families are unable to fully support the school, because their economy, highly dependent on jewelry production, supports only a small portion of the population. Unemployment often reaches 30% with alcoholism and suicide direct outcomes of this situation. A famous Franciscan missionary once said,“The first 500 years of evangelization are the hardest.” The Franciscans have had a presence in Zuni for about 400 years now.